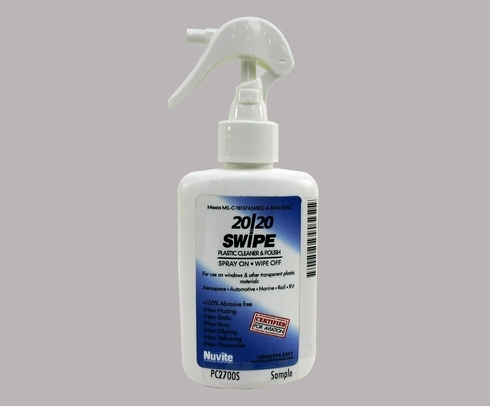 Formulated specifically for aircraft transparent plastic windows, 20/20 SWIPE has been used on military aircraft for decades. Meeting MIL-C-18767A(ASG) and AMS 1535C specifications, 20/20 SWIPE is popular with many government agencies, and a favorite of helicopter pilots, air racers, and motorcyclists, among many others. 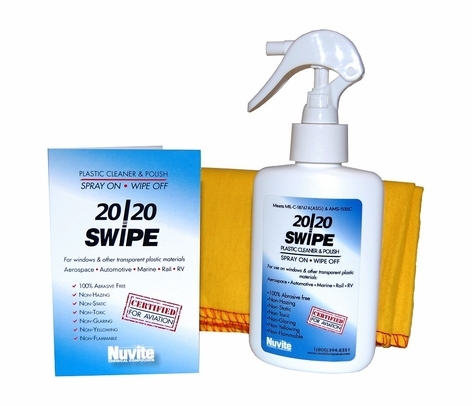 20/20 SWIPE�s easy spray on / wipe off application is fast and thorough. Lubricating oil, grease, soil, bird droppings and insect carcasses are wiped away with minimal pressure leaving a streak free, clear transparency. 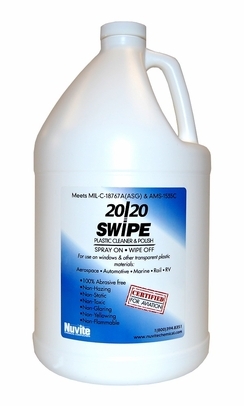 20/20 SWIPE cleans without scratching and will not affect painted surfaces or other aircraft material. Its unique formula assures even coverage in sun or shade. Regular polishing with 20/20 SWIPE delivers additional benefits. It's UV protectant formula inhibits UV induced crazing and discoloration. It also deposits an anti-static barrier prohibiting dust, ash, lint, and other atmospheric particulates from statically adhering to transparency surfaces.